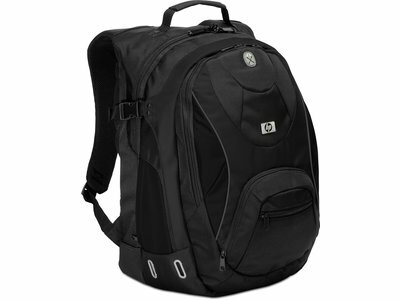 The HP Sport Backpack is designed to fit notebooks with up to 17” screens and includes a number of storage pockets for mobile accessories. The front pocket includes an mp3/mobile phone pocket with a headphone out port, a business card holder, pen loops and removable storage pouch. Two quick-access front pockets provide space for items you may need easy access to while on the go. The interior has space for file storage and includes a padded notebook compartment to make sure your notebook is protected. The padded mesh back panel and ergonomic shoulder strap are designed for comfort to avoid strain or injury while transporting the case. Great for students or young executives, this case is designed to accommodate all of your mobile needs.